The crowd was small for a Friday night, a shade over 7,200, as the San Diego Gulls hosted the Stockton Heat. Gulls play-by-play announcer Craig Elsten blamed the low turnout on Super Bowl weekend and on the opponent—like the Gulls, the Heat were treading water in the middle of the American Hockey League’s Pacific Division. Still, there were more people than you might expect at a minor-league hockey game, and those in attendance made plenty of noise. The Gulls are the AHL affiliate of the Anaheim Ducks, who play 90 miles to the north. I hadn’t been to a game in more than 20 years, and wasn’t sure what I’d see. My enduring memories of minor-league hockey come from Slap Shot, and from a previous incarnation of the Gulls that played in the lower-tier International Hockey League. Those Gulls relied on mostly forgotten gimmicks that distracted fans from the quality of the hockey. I met my wife at one of those games back in the day, so I can’t complain. She was, you might say, sufficiently distracting. The AHL doesn’t need gimmicks, preferring instead to showcase its on-ice talent. Nearly 90 percent of NHL players last year had previous AHL experience, which “makes the leagues indistinguishable in terms of the size and speed of the players,” according to Elsten. Each of the league’s 30 teams is affiliated with an NHL club. Many of the affiliates are geographically close to their parent, with San Jose and Toronto hosting teams in both leagues. This makes a difference. As Elsten told me, “The NHL fans like to see their future stars in action, and the synergy between parent clubs and affiliates is apparent.” For example, current Ducks starting goaltender John Gibson began the season with the Gulls. Despite my initial skepticism, the game action confirmed Elsten’s assertion that “the quality of play in the AHL is just a tick below the NHL.” I haven’t seriously followed hockey in years, but I grew up down the street from where the Los Angeles Kings practiced during the Triple Crown Line years and watched my fair share of games. The fan experience was less “wacky” than I’d imagined. There was the usual too-loud music (says the old guy) and t-shirt toss. A mascot named Gulliver traveled from section to section banging a drum in slow triplets as fans around him chanted “Let’s Go Gulls.” A few lucky fans got to ride the Zamboni between periods—there’s even a song that goes with it. And yet, as competitive as the game was, these moments are what define minor-league hockey. The game brings members of the community together in public to share an experience. Words like “fellowship” and “communion” might be too strong, but individuals from different walks of life gather and join together for a common purpose: to enjoy a game of hockey and each other’s company. Elsten noted that “AHL teams do a good job of creating fun nights for their fans, theme nights or charitable promotions to help keep the season’s flow fun and original for fans.” Case in point, this was both $2 Beer Night and San Diego State University Aztec night. The $2 beers were of the macro variety. You could, if so inclined, pay six to seven times as much for a local craft brew. On the other hand, as several people in our section demonstrated, six or seven plastic cups of the cheap stuff were enough to make you forget the taste and turn into a screaming lunatic. To celebrate Aztec night, the Gulls had an SDSU ensemble sing the national anthem. They also paid tribute to the school’s legends (including Tony Gwynn and Gregory Peck) throughout the contest a practice which got a warm cheer each time. There were college students, families, young couples possibly on dates, multiple generations together. During the first intermission, there was a trivia contest, and a dance-off between two people who couldn’t dance (says the guy who can’t dance). During the second, there was a giant beer pong match between two contestants who attempted to lob a ball into various trash cans for various prizes. There was also a puck toss, where fans could buy pucks (not real ones, obviously) and try to hit a target on the ice for more prizes. The wackiest moments came during timeouts. A troupe of slender young women with bare midriffs would skate out onto the ice and push giant brooms. They were quite good at it, but I’m still trying to understand the symbolism of it all. Perhaps they were paying homage to blues legend Elmore James’ “Sweep My Rink,” but probably not. Either way, it’s a thing that happened. As for the game itself, the Gulls won, 4-2. They jumped out to an early 2-0 lead, with Stockton pushing hard the rest of the way to keep the drama intact and leave the home crowd satisfied. Exiting the arena afterward, we took one last look at the concourse, weaving our way through the rest of the crowd. We had all shared the experience, which would inform our personal history, our personal mythology. For my wife and I, who first met here many years ago, minor-league hockey had become a part of us. For those others in attendance tonight—the college students, the couples on a date, the families, the Zamboni riders, the beer pong contestants—this could have been either a fleeting incident, here to be enjoyed and then forgotten, or it could remain with them for the rest of their lives, becoming an important part of their own personal histories, as one such game had become for us. Such moments at big-league events can have profound and lasting effects as well, but the experience feels less intimate when you share it with 17,500 (last year’s average attendance in the NHL) rather than 7,200. As we walked I wondered if a better hockey game might have distracted me from talking to my wife on our own fateful night decades ago. 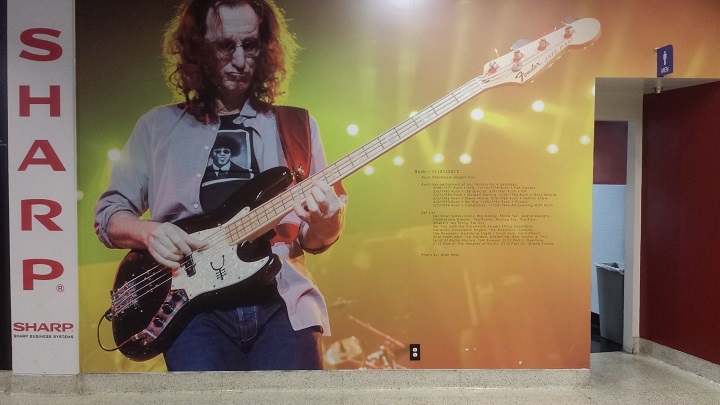 We passed a giant photo of Rush’s Geddy Lee on the way out (they’d played at this arena many times, including once when we were in attendance) and emerged into the cool night. I was glad to see that the quality of hockey had improved since our last visit, but even more glad it hadn’t been better back then. Had circumstances been different, our lives also would have been different. For one thing, my wife wouldn’t have had to listen to so much Rush. Oh well, you can’t have everything. Geoff Young is a writer who has lived in the limelight for Baseball Prospectus and Padres Public. You should follow him on Twitter.